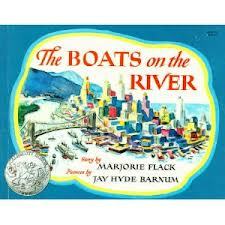 The Boats on the River won not only a 1947 Caldecott Honor award, but also my appreciation. I found this book, written by Marjorie Flack and illustrated by Jay Hyde Barnum, to be one of my very favorite Caldecott books thus far in our reading. Probably due to having been raised seeing large bodies of water nearly every day and being familiar with all of the boats introduced in this book, I enjoyed using this non-fiction book to explain many different types of boats and their various uses to my land-locked children. 1. “Excellence of execution in the artistic technique employed.” – Beautiful illustrations depicting a variety of waterside scenes. I especially appreciated that the artist allowed his young readers a close-up view of the vessel being discussed, back-to-back with another picture that put the size of the boat into perspective with its usual surroundings. 3. “Appropriateness of style of illustration to the story, theme or concept.”– The blues and greens, accented with various other colors, seem very appropriate for the watery scenes in this book. 4. “Delineation of plot, theme, characters, setting, mood or information through the pictures.” – The theme, setting, and information were thoroughly presented through the pictures. 5. “Excellence of presentation in recognition of a child audience.” – I am not sure if my children enjoyed the book as much as I did, but I know we all had fun talking about the types of boats I remembered from my childhood.